Courtney Lawes will return to action in Saints’ Champions Cup game at Racing 92 on Saturday. The England lock, who comes in for Jamie Gibson, will play at six in the Stade Yves-du-Manoir showdown, with boss Jim Mallinder mixing things up. Lawes has not started since sustaining a knee injury in the defeat at Sale on November 1, but he lines up alongside Teimana Harrison and Sam Dickinson in the back row. Victor Matfield also comes in to make his first Saints start, having appeared from the bench in Aviva Premiership wins against Bath and Gloucester, while Alex Waller is back in the side, replacing brother Ethan. The other two changes come in the backs, with club captain Lee Dickson replacing Kahn Fotuali’i at scrum-half and Tom Stephenson in for George Pisi in the centre. Stephenson will play at 12, with Luther Burrell moving to 13. Ahsee Tuala, who scored two tries in the Champions Cup win at Glasgow Warriors last month, is fit enough to be named on the bench. But Saints remain without Dylan Hartley (concussion), Calum Clark (shoulder), Alex Corbisiero (knee), Tom Wood (shoulder) and James WIlson (arm). 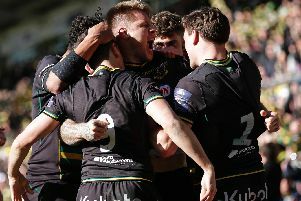 Saints: Foden; Elliott, Burrell, Stephenson, North; Hanrahan, Dickson (c); A Waller, Haywood, Brookes; Paterson, Matfield; Lawes, Harrison, Dickinson. Replacements: Williams, E Waller, Hill, Day, Gibson, Fotuali’i, Myler, Tuala.